In this short communication we want to give an overview of how OpenMath is used in the European project “SCIEnce” . The main aim of this project is to allow unified communication between different computer algebra systems (CASes) or different instances of one CAS. This may involve one or more computers, clusters, and even grids. 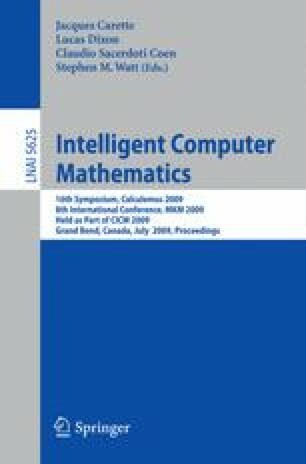 The main topics are the use of OpenMath to marshal mathematical objects for transport between different CASes, an alternative textual OpenMath representation more suitable for human reading and writing, and finally the publicly released Java Library developed for the project.